Russia’s Justice Ministry, which has the right to declare organizations “foreign agents” without their consent, has added a significant number of NGOs to its list. 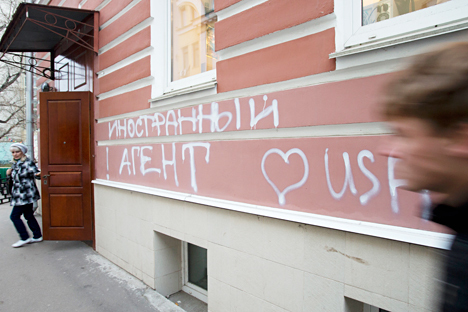 In the two years since the passage of Russia’s controversial law on NGOs in July 2012, human rights and research organizations receiving foreign funding have refused to register as “foreign agents” with the state as required under the legislation. Now, however, this is no longer an option. On June 4, President Vladimir Putin signed into law a bill allowing the Justice Ministry to register NGOs without their involvement. NGOs registered without their consent have the right to protest the decision in court. The law on NGOs, which was passed in July 2012 and came into effect in November that year, requires NGOs that receive foreign funding to register as foreign agents and indicate this status on all print and digital materials. In June, the Justice Ministry registered five NGOs as foreign agents, including vote-monitoring organization Golos. It added five more in July, and put the Association of Soldiers’ Mothers and the Freedom of Information Foundation on the list in August. Far from being antagonistic to the government, the PIR Center had even asked Russia’s Foreign Ministry for funding for a research project before it was added to the list. Fyodor Lukyanov, chairman of the Council on Foreign and Defense Policy, an independent organization that works to influence Russia’s foreign policy, thinks that it is possible for the government and NGOs to work together on certain projects. “In order to form trust-based relations among independent centers, the government and foreign donors can implement joint research projects that are interesting for all parties,” Lukyanov said. However, this has not been the experience of Russian NGOs so far. Natalia Taubina of Public Verdict, which offers legal aid to people who have been victims of Russian law enforcement, said that the decision by her organization to accept foreign funding does not mean that they work on behalf of foreign organizations. “We submit applications to participate in tenders for foreign grants on equal terms with NGOs from other countries. This is a normal, worldwide practice that does not in any way mean that the receipt of money from abroad automatically forces us to work for a foreign government. There is an unspoken principle among public organizations – to get no more than 30 percent from a single source in order to preserve independence,” Taubina said. Public Verdict was added to the foreign agent list in July. Taubina said that now the Public Verdict Foundation faces difficulties working with Russian organizations, possibly as a result of the “foreign agent” label. “We have held trainings for investigators in the Russian regions for a long time, but now they are not letting us,” she said. There is some hope for organizations that believe they have been added to the list unfairly. Golos, which was fined in July 2013 for failing to register as a foreign agent and had its operations suspended for six months before being added to the list in June, won a ruling from a Moscow City Court in September saying that it is not a foreign agent. Golos had long argued that it should not be subjected to the law because it stopped accepting foreign funding in November 2012 after the law came into force. However, actually being removed from the list has proved harder than it seems. “The procedure for removal from the register of foreign agents is not prescribed in a single law and, despite the court’s ruling, we’re still on the list,” said Grigory Melkonyants, co-chairman of the board of Golos. But while Russian NGOs are willing to accept the consequences of receiving foreign funding, foreign donors have been less willing to continue their support of these organizations. “Foreigners are assuming that all NGOs in Russia will cease to exist sooner or later, so there is no need to spend money on them,” said Alexander Cherkasov, chairman of the board of human rights organization Memorial. On Oct. 10, the Justice Ministry filed a lawsuit with the Supreme Court to liquidate Memorial. Cherkasov believes the decision is politically motivated and has nothing to do with his group’s refusal to register as a foreign agent. “The government should not interfere in the activity of public organizations and manage them by allocating state grants,” Cherkasov said. The organization will have its day in court on Nov. 13.